We preserve your safety and independence with custom solutions. Live at home...Not A nursing home. Senior, handicapped, and disabled client renovations and remodeling must be grounded in empathy, client needs and desires, and a truly customized approach for each and every person. We have over 25-years of experience doing just that. No Place Like Home Remodeling is the only senior, handicapped, and disabled remodeling and renovation specialist anywhere near Roanoke or Salem VA with an on-staff occupational therapist. Our licensed occupational therapist Jennifer, has spent the last two decades assessing thousands of homes in the Roanoke Valley, and she has successfully helped many people safely retain their independence through suggested home renovations. We started No Place Like Home Remodeling because, time and time again, we were met with limited helpful resources and a shortage of specialized, senior-focused contractors in our local community here in the Roanoke Valley. This left many individuals and their families faced with the difficult decision of either accepting tremendous risk in returning home, or leaving their independence behind for an expensive nursing home. This could have been avoided with the proper resources and expertise. Our staff, with the focus on each specific individual’s needs, will strive to make your home accessible and safe...maximizing independence and quality of life. That is why we offer free, no-pressure, no-obligation home assessments to see how we can help you. We are licensed and experienced professionals who care. Empathy is essential...but so is expertise. That is why No Place Like Home Remodeling has ensured we only have experts serving you during the assessment, planning, and construction phases of your accessibility, safety, and independence focused home renovation. You've already met our licensed and experienced occupational therapist, but we also happen to be expert and experienced, licensed, bonded and insured Virginia Class-B contractors. But we didn't even stop there. 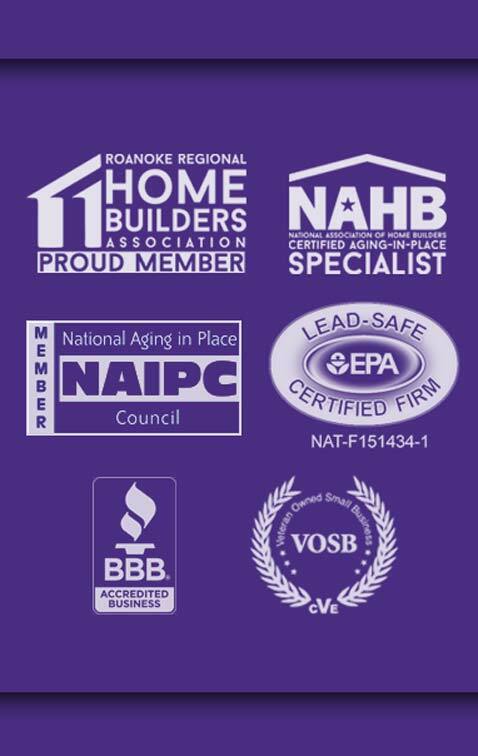 We have proudly earned the designation of Certified-Aging-In-Place Specialists [CAPS] (a protected title earned through training and certification through the National Association of Home Builders). Some people use this title as a sales tool, but it is who we are. It is what we do. We also happen to be an EPA-approved Lead-Safe Certified Firm. We not only have the experience to effectively assess the safety of your home and suggest effective, high-value adaptations, but we also have the expertise to complete these adaptations, quickly, with the highest quality and craftsmanship, all with you, your safety, and your independence in mind.